Haga un zoom a lo largo de las suaves aguas del Colorado a bordo de un veloz barco a reacción durante esta experiencia de crucero de 2.5 horas al atardecer. Disfrute de las temperaturas más frescas en el agua mientras explora los arcos del río, los acantilados de rocas rojas y los petroglifos. Termine el viaje de vuelta en el muelle, donde disfrutará de una cena con horno holandés incluido saboreada con una vista de la puesta de sol. Ver fauna nativa en su entorno natural. Great guide and a wonderful opportunity for some great pictures. Good guide and fun time on tour. Second time for this tour. The trip was exactly as advertised and most enjoyable. Our Captain was most knowledgeable and had a great sense of humor. Appreciated the on board water and soft drinks. The buffet dinner was delicious and high quality. It was beyond my expectations! My husband and I and our 14 year-old grandson enjoyed this event very much. Our guide was fun and knowledgeable and not only did we see many sights that you can't see if not on the river but learned a lot. It was hot but he did a good job of keeping us in the shade as much as possible and we got a little spray from the turning boat - this felt great! The boat ride seemed maybe 30 minutes too long and we killed some time at the turnaround. The dinner was great so, overall, we loved the evening. This should be titled evening jet boat ride. Being summer, sunset was nowhere to be seen at 6pm. After a hot day of hiking this was a very refreshing ride. 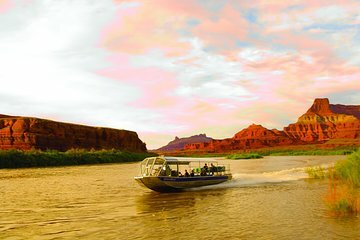 This is a 20 mile high speed boat ride downstream on the incredibly scenic Colorado River. Stops are made along the way to point out locations of interest. Captain Andrew was very entertaining. Dinner is a group seating, buffet with food being good, if not a bit uninteresting. Children should like the food. Better food choice and individual tables would have made this a five star evening. The jet boat tour was awesome. The tour guide was entertaining as heck. Fast moving boat hold on to your hats. Not for those that are afraid to get their hair messed up. The dinner was yummy and a nice cap to the whole experience. Tour guide was nice and boat left promptly. This is not a dinner cruise- it is an hour long jet boat ride down the river, back, and then a cowboy style meal in a big dining hall. Not many sites along the way worth noting but still a nice way to view the area.